The workshop had two goals: To help people install free software on their phones and to develop/document some guidelines that trainers for such workshops could use. Our workshop check list is here: https://wiki.fsfe.org/Android/Workshop. Personally, in the first go, I was more interested in helping someone unlock her phone. ‚Meta talk‘, later – hands on, first. Altogether, there were twelve to fifteen people attending the meeting and four or five freed their phones. This meant: They installed CyanogenMod, an Android distribution developed by a community, and the F-Droid app instead of Google Play. 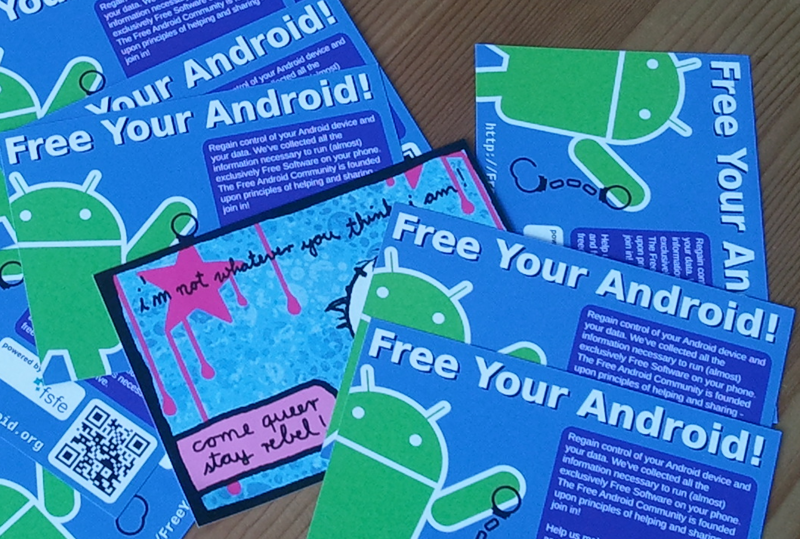 Fdroid offers a choice of free software that can be installed as comfortably as from Google Play. It was fun! The atmosphere was very relaxed, everybody introduced her_himself shortly in the beginning, we had enough time, it was easily possible to ask for help or advice (from my point of view). In the end, there were sympathetic „yay!“ sounds of success and applauding for each phone. I actually helped to liberate one single phone (which seems to be little). The process took about four hours because we first had to update the Android already installed on that Samsung Galaxy S II. After that we could begin, and after that we followed a wrong download link in the description in the wiki and after that, it worked. It may be possible to help more than one person at once. But I agree with one of the FSFE activists: For me, this might only work if they all have the same phone. It was good to give an intro for everyone about what we were going to do. We should use the questions people asked to improve the introductory slides: For example, we could add an overview of ‚what you loose‘ versus ‚what you gain‘. We should also ask participants who knew little about Android before the workshop if the intro was too short for them and if so, extend it. For the person I helped the most important topic was public transport apps. Talking about public transport apps, we realized how much work needs to be done to convince developers to publish their apps as free software. And by the way, for official public transport apps this should go without saying! Should go without saying, too, but usually doesn’t: I attended a workshop related to Free Software without being told „oh, you as a woman blahblahblah“. That’s a real #win. Summary: I’d like to do it again! As it is a lengthy process to flash phone by phone, it would be so much cooler to have the phone manufacturers deliver their devices with free software only, e.g. CyanogenMod, that is to cooperate with the community from the beginning. I think the problem starts a bit earlier than what the license of the apps themselves is. I think the core problem is that we’re talking about „one app per public transport provider“ is the problem – that every company does their own special stuff. What I’d love to see: A common standard to access timetable and pricing information – worldwide and across public transport companies – and being able to book online tickets through that. Then we’d only need a single free software app to access that standard and we’re done.